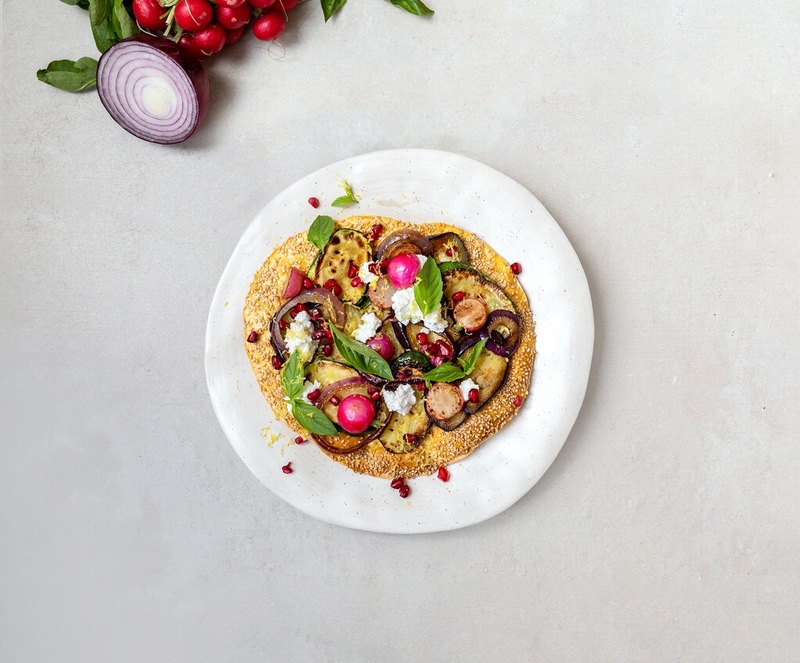 Do you want to make it easy for yourself this Easter With the Crisp app you have the tastiest groceries at home, such as the ingredients for this piadine with grilled vegetables. Cut the eggplant, zucchini, onion and radish into small pieces and pour a small dash of olive oil over it. Season the vegetables with salt and pepper and spread them out in a baking dish. Put the dish in the oven for about fifteen minutes, until the vegetables are nicely roasted. Spread a thin layer of egg yolk on the outer edges of the spelled wraps and sprinkle with sesame seeds. Bake the wraps in the preheated oven at 180 degrees. The piadines become nicely airy and crispy in about 5 to 8 minutes. Remove the wraps from the oven and cover each wrap with the vegetables. Crumble the ricotta cheese over it and garnish with pomegranate seeds, basil and lemon zest.